Now taking reservations for our 2019 season which will begin in May. Saturdays & Sundays: 10:00am, 12:00pm, 2:00pm, 4:00pm, & 6:00pm. Wednesdays - Sundays: 10:00am, 12:00pm, 2:00pm, 4:00pm, & 6:00pm. Prices do not include 10% PG County Amusement Tax. Reservations are required. Check availability of any trip you wish to take. 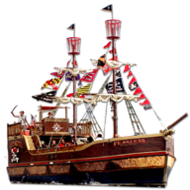 The pirate ship can accommodate up to 60 passengers per cruise. We will not sail with less than 15 passengers. The pirate ship sails Rain or Shine. Read the full Reservation Policies. at your listed check-in time and Check-in at the ticket kiosk. including pirate costumes, names, tattoos and drawn-on facial hair. 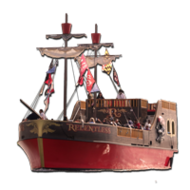 The pirate ship will depart promptly 30 minutes after check-in time. Reserve your tickets on-line now & pay securely with Credit Card.